Would you like to save money homeschooling? Would you like to have your entire family, whether two kids or twenty, studying the same time period of history? Would you like to have prepared lesson plans, review questions, and maps? Well… let me introduce you to a curriculum that does all of that and saved the day for me three years ago: BiblioPlan. You may not have heard of it or you may have, but may not realize all it does. This curriculum has been around for over thirteen years, but got a revamping about four years ago when Rob and Julia Nalle bought it. I would say it was upgraded. In a serious way. 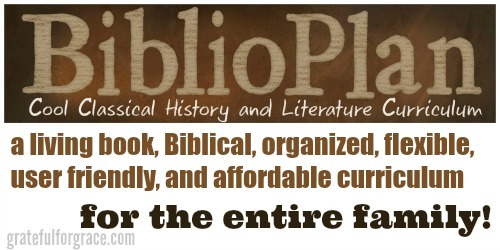 BiblioPlan is a living book curriculum that is Biblical, organized, flexible, user friendly, affordable, and for every school age kiddo in the family. Living book curriculum: Beautiful, well written, books penned by those well versed on the subject are the teaching books of this curriculum. Both nonfiction and fiction alike. I pretty much consider these books friends and hug them often. Really, really fantastic books. If you have used Sonlight (and I did for seven years), please know those fabulous books are here too. The selections are really great at every level. And the high school was upgraded wonderfully when Rob and Julia rewrote the Family Guide. Biblical: Not only is Bible reading scheduled into the lesson plans (each year of the four year cycle has a different emphasis), but the Companion is written from a Biblical perspective, the Cool History Questions have Biblical emphasis, and the living books have missionary and church history included. I love this aspect of the curriculum a ton. There are non Christian spines included in the Family Guide (which has the lesson plans) for those that already own them and prefer them for whatever reason (Story of the World [SOTW] and Usborne History), but Mystery of History (MOH) and the Companion are scheduled too, which are both written from a Biblical standpoint. Organized: First of all, my BFF is in this curriculum. This is the BiblioPlan Family Guide. She’s my BFF because she has all the lesson plans preprinted and ready for me for history reading, Bible reading, literature selections, maps, crafts, movies, supplemental writing, and more. She gets her very own blog post, so check it out. Fan.tas.tic. Secondly, it has four levels (so that they are ability appropriate) of Cool History Questions, which are the review and reinforcement questions for the history studied that week. Thirdly, there are two levels of maps corresponding to each week’s study all done for me too. Fourthly, both of these (Cool History Qs and Hands on Maps) come with answer keys. Ahem. Super duper. All of this is organized and laid out in an easy to use manner for Mom. Which is really, really important for homeschooling. Amen? Flexible: Each component of BiblioPlan may be purchased separately. This allows you to use what works for your family at that time as well as allowing you to cater to specific children. The Cool History and Hands On Maps are not labeled by “grade”, which allows you to move up or down the levels depending on your child’s abilities. Also, the fact that many different “spines” are scheduled makes this a truly flexible curriculum. You can use which ever spine works best for that child. For example, my junior high and high schoolers use the Companion for their history spine, but my elementary students use SOTW and MOH for theirs. This allows me to be sure to meet my students where they are instead of a curriculum forcing them to a level to which they aren’t ready. Another way that BiblioPlan is flexible is that you can use PDFs for everything or hard copy or mix and match. This allows for paper free homeschooling and on the go schooling without the need for hard copies. Flexibility is also key in that you can choose which literature selections AND you can substitute with a similar book if you already own it. This was a HUGE deal for me! HUGE! I started using BiblioPlan after thirteen years of homeschooling, so I had a ton of books. Really good books. Many of them were scheduled in BiblioPlan so I didn’t have to buy new books, but where I didn’t have the book listed in the Family Guide, I usually had a book on the same topic or one that I wanted to use instead. I lost nothing but making these substitutions. Except I lost spending. Ha! I mean that I saved money by being a better steward of the books I already owned. This is a great aspect of BiblioPlan for those of you who like to utilized the library. For example, if the exact title of a book on Harriet Tubman is not available, but others are and you like them, then use those. User Friendly: Switching to a new curriculum always takes a step or two to get one’s bearings, but I had little adjustment time as I made the switch to BiblioPlan. 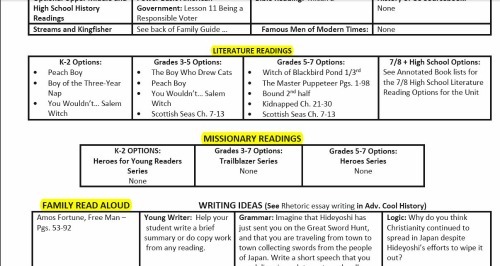 Once you get a feel for the lesson plan pages in the Family Guide, you hit the ground running. No flipping through big binders trying to get to the sections you are supposed to read aloud, no writing your own lesson plans or trying to find books to include other kiddos, and no juggling of components. Open and start reading. Do the maps. Do the questions. Do the timeline. Do whatever you have chosen, and it’s all ready for you. Affordable: I can not believe how much money I have saved by switching to BiblioPlan. Seriously. Lots of money. Granted I was using a curriculum for my whole family it was pricey. At the time, I thought it was the only K-12 homeschooling curriculum that could keep us all on the same page in history, but I was wrong. Still…. when you see the prices, you will see how incredibly affordable this is for a family. When you realize that you can substitute literature you already have (or the library has), you see more savings. When you understand that you can buy a la carte as opposed to one big package of materials or books you may have to make changes to, then you see more savings. Every School Aged Child: I’m not kidding when I say that the lesson plans in the Family Guide are for kindergarten through twelfth grade. Use which ever components of the plans you like for each child, but you don’t have to figure it out. It’s done for you. You do have to choose which spine you want to use with each child and which books you want them to read, but the selections are there, scheduled, and ready when you are. I absolutely love that Paul Louis, our seven year old right now, and Noah, the current sixteen year old, are both familiar with Good Queen Bess and Sir Walter Raleigh this week and can chat, play, or watch something related to those historical figures and do it together. I’ve written a full review on BiblioPlan here, so check it out. But, homeschooler, if you think that the only K-12 curriculum for history, literature, Bible, and geography is Tapestry of Grace (TOG) or that it can’t be done, please know that’s not true. After using TOG for three years and spending a whole lot of money, I found BiblioPlan and realized my dream and goals could be met with less work for me, less money for me, and more pleasure for me. Check out BiblioPlan and ask any questions in the comments! Previous post: Baby Girl is Fearfully & Wonderfully Made!